Designed to produce safe drinking water in any type of emergency, this system is able to purify fresh water from wells, boreholes, lakes, ponds, rivers, rain water, swimming pools, questionable city treated water or storage containers. Note: These systems are not intended for seawater desalination. 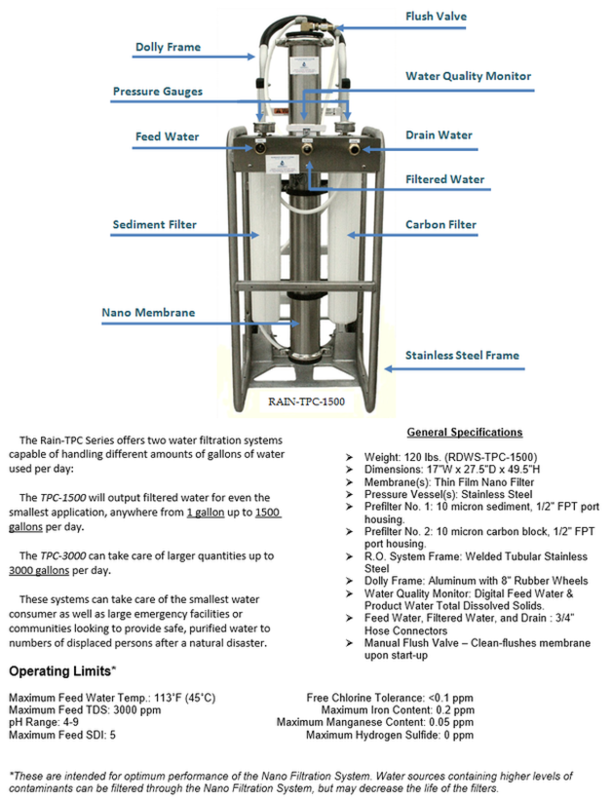 The Portable Rain-TPC Systems include a welded all stainless steel frame and pressure vessel, integrated aluminum dolly cart with 8” wheels, dual 2.5”x20” sediment and carbon block prefilters, prefilter in and out pressure gauges, 4”x40” special membrane filter element(s), Easy-to use ¾” standard hose inlet feed water, outlet filtered water and drain water connectors, digital electronic water purity monitor for feed and product water, and combined flow restrictor/membrane flush valve. The pressure gauges provide an indication of prefilter condition and feed water pressure while the water quality monitor shows the mineral content of both feed water and product water allowing verification of proper membrane operation.